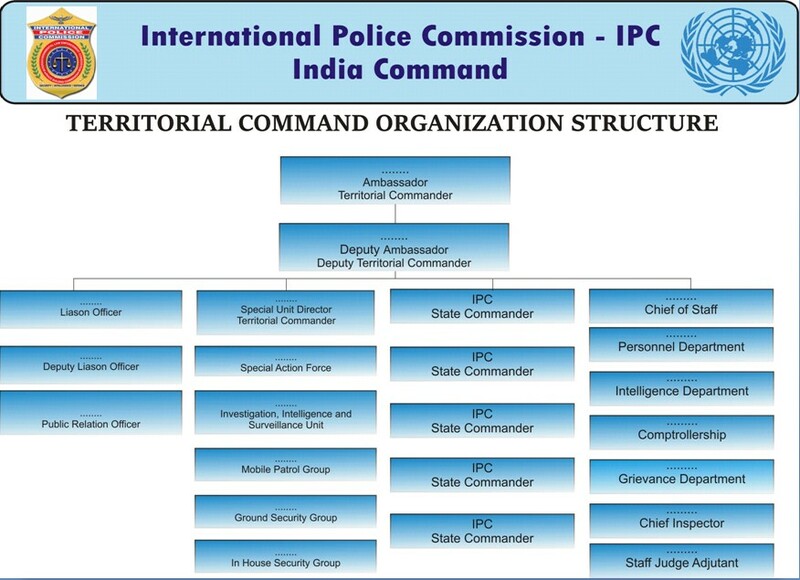 The International Police Commission - IPC India (Peace Building Commission Defence Version)(Intergovernmental Law Enforcement Consortium) is currently spearheaded in India by Dr. Arvind Kumar Sharma, Commanding General of the IPC India and consists of members, a force of strong men and women nationwide, from various professional lines such as businessmen, doctors, engineers, architects, lawyers, retired and active peace officers of the law, soldiers, veterans and other professionals who stand for peace, justice, liberty and democracy. Being a paramilitary group, the entitlement of military ranking is adopted. As per Constitution and Bylaws corroborate that Officers and Personnel shall be conferred with military rank in order to enforce the highest and strict discipline within the rank and file, a sublime objective in bringing the Officers and Personnel with the finest camaraderie. The IPC India expects support and cooperation from all well renowned duly registered Ex-CPMFs Personnel Welfare Associations as their honourable members are already trained, cultured and committed. We are thankful to all and solicit their togetherness with us to train the general public by providing self defence training and values of our ancient culture mainly to rural and sub-urban areas at a reasonable charge. The International Police Commission – IPC India serves as a catalyst for a peaceful global environment. We provide worldwide services essential for private entities, government authorities, and law enforcement agencies by assisting resolve crimes against humanity. The Spirit of the Universe is calling upon all peace-loving citizens to volunteer and join us in this noble endeavour”. 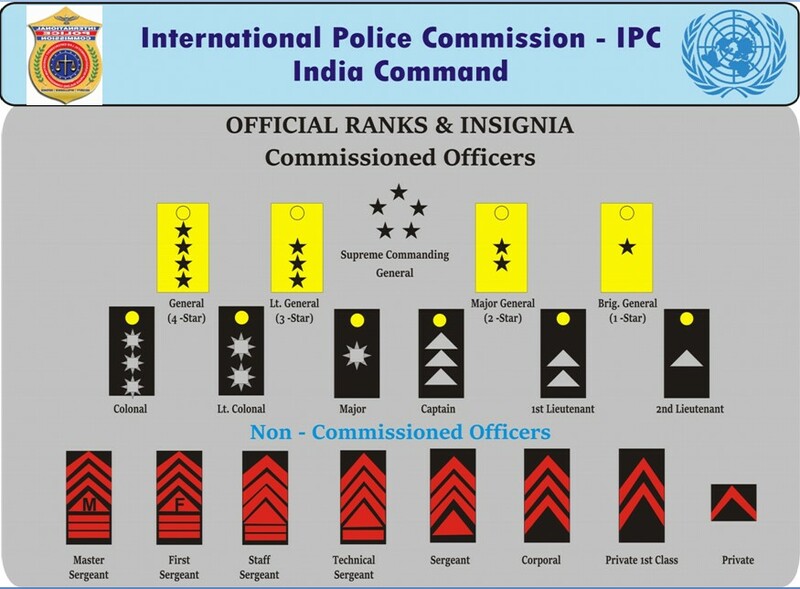 The International Police Commission – IPC India is a Paramilitary Organization based in the Republic of India with extension in other UN nations to provide Training to Private Security Guards and Taekwondo Training to students in the educational institutions AND Commando and Kung-fu a Chinese Martial Art Training i.e. War Fighting Method training to the Trainers of Military, Paramilitary, Police and other forces as per syllabus of different courses to fight with arms and/or unarms against high level Corruption, Terrorism and Criminal Syndicates. These Training Programs are enough to establish Peace especially in the sensitive areas of the country. 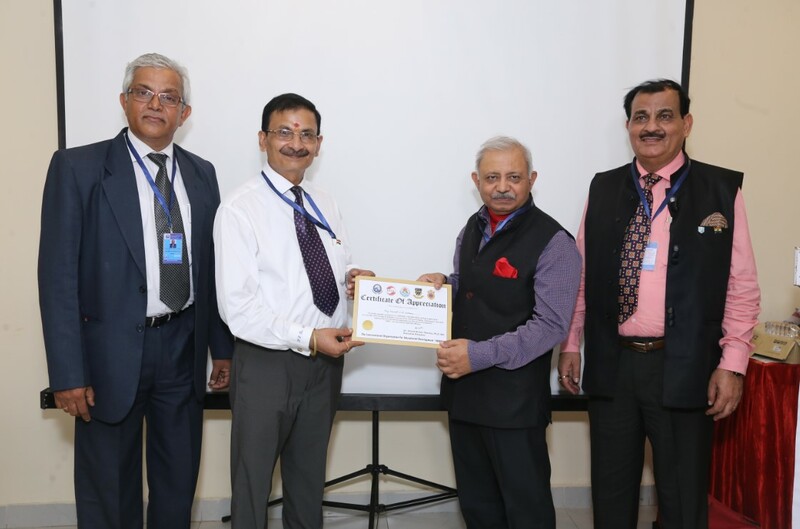 The International Police Commission – IPC is also ready to provide Advanced Training to the Police Personnel and other Law Enforcement Agencies with the consent and mutual support of the concerned departments. 1. Act against Corruption "ACT"
13. Nexgen Exhibitions Pvt. Ltd.
23. United Nations World Rehabilitation Organization "UNWRO"
Your enthusiasm and your ability to motivate others has resulted in a significant increase in the organizations missions to establish crime free nation. Our organization appreciates your efforts and the assistance you offer to support our advocacy. Please accept my sincerest gratitude for your valuable support in the IPCIG. For Advance Democracy: Voters were cheated because officials stuffed ballot boxes and bought votes. Voters are being cheated through Divide and Rule Policy. Voters should not be easily influenced by those people who try to divide on the basis of the Caste, Creed, Religion and Gender. To Protect the Environment: The forest was plundered because local officials accepted a bribe from illegal loggers. To Support Justice: The case was dismissed because the judge accepted a bribe and set a known criminal free. To Improve Health: The life was neglected because this baby’s mother could not pay the bribe for care at the hospital. To Strengthen Education: The children were never taught because a civil servant stole the funds needed to run the school. To Promote Economic Development: The bank was robbed because the bank manager embezzled millions of dollars each year leaving many people without pensions. To Protect the Grains: Millions are not getting even one time bread because grains are not properly stored in safe area and somebody has destroyed the grains through water to sell on low rate to the wine manufacturers? The IPC is an acronym of the INTERNATIONAL POLICE COMMISSION classified as a paramilitary group. The specific purpose of the organization is to create a unified front with private and government functionaries to problems affecting human rights, economics, social affairs, control and prevention, and trafficking of illegal drugs. Its secondary purpose is to assist domestic and worldwide government in humanitarian and peacekeeping operations. Both worldwide and locally, the IPC India is coordinating and sharing the campaign against terrorism and deeply involved in community projects of law enforcement agencies. Where does the organization get funding? The funds of the organization derives from membership fees, gifts, donations and contributions from private and government sectors, charitable institutions, fund raising projects, grants from private companies/philanthropic entities, established through requests to local, national and international prerequisites. Anyone who is active and retired Diplomat, Jurist, Advocate and an officer from Security, Intelligence and Defence, desires to join the organization must be of good moral character and must never be convicted of any crime. He must be physically and psychologically fit and must adhere to the laws of the land. When a person freely enters an organization or association, that person believes in the principles which the organization stands for. He does so in exercise of this freedom. He is expected to embrace the principles by which the organization is created and through which it thrives. He is expected to abide by the reasonable laws, rules and regulations which the organization as a whole, agrees to implement. Therefore, when a new member applies for membership, he or she is expected to similarly uphold the laws and regulations, the Integrity of the Organization and or association by primarily abiding by the mission or reasons for its existence. It is only when you have come to the conclusion that you have joined this organization FOR SERVICE, FOR LOVE , FOR COUNTRY and GOD, then you can safely say, you have fulfilled your vow. Why are the members given military ranks? Being a paramilitary group, the entitlement of military ranking is adopted as per the organization's Constitution and Bylaws corroborated that Officers and Personnel shall be conferred with military rank in order to enforce the highest and strict discipline within the rank and file, a sublime objective in bringing the Officers and Personnel with the finest camaraderie. Is in-house training a composite of the organization? Personnel and Officers are subjected to an in-house training and other aspects relevant to their designated ranks and assignments. Are the IPC providing training to other Peace-keeping Organizations? Are members given allowances or remuneration? NO, All members are volunteers, unless otherwise that grants will be accorded to the organization, pro-rated allowances will be assessed upon the approval of the members of the Board of Directors, on assigned working committees.